The "Chris Isaak" - model. The pickups are mini-humbuckers made by Gibson. This is one of the few Harmony-made Silvertones* that wasn't sold under the Harmony or any other name. The closest Harmony counterpart would be the Meteor. The Gibson pickups also seem to be unique to this model. I haven't seen them on any other Harmony or Gibson. 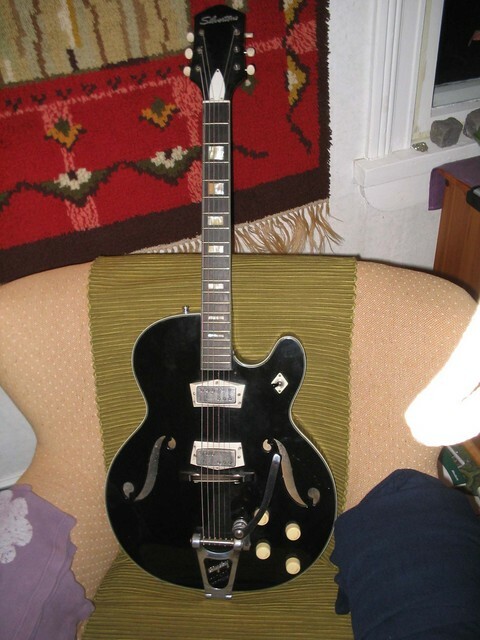 Since this picture was taken this guitar has been equipped with a repro pickguard. Pickguards for almost any Harmony model can be found as reproductions on ebay. *Silvertone was the department store chain Sears' house brand. They were sold in Sears department stores and through the Sears catalog. 60's Silvertones were made by Harmony, Kay and Danelectro (maybe others as well). Sears put the name on japanese imports by the late 60's. Today the Silvertone brand is used on guitars made in Korea by Samick.